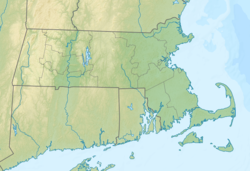 Gillette Stadium is a stadium located in Foxborough, Massachusetts, 28 miles (45 km) southwest of downtown Boston and 20 miles (32 km) northeast of downtown Providence, Rhode Island. It serves as the home stadium and administrative offices for both the New England Patriots of the National Football League (NFL) and the New England Revolution of Major League Soccer (MLS). In 2012, it also became the home stadium for the football program of the University of Massachusetts (UMass), while on-campus Warren McGuirk Alumni Stadium was undergoing renovations. Gillette will continue to host higher attended home games. The facility opened in 2002, replacing Foxboro Stadium. The seating capacity is 65,878, including 5,876 club seats and 89 luxury suites. The stadium is owned and operated by Kraft Sports Group, a subsidiary of The Kraft Group, the company through which businessman Robert Kraft owns the Patriots and Revolution. The stadium was originally known as CMGI Field before the naming rights were bought by Gillette after the "dot-com" bust. Although Gillette was acquired by Procter & Gamble (P&G) in 2005, the stadium retains the Gillette name because P&G has continued to use the Gillette brand name and because the Gillette company was founded in the Boston area. Gillette and the Patriots jointly announced in September 2010 that their partnership, which includes naming rights to the stadium, will extend through the 2031 season. Additionally, uBid (until April 2003 a wholly owned subsidiary of CMGI) as of 2009 continues to sponsor one of the main entrance gates to the stadium. The Town of Foxborough approved plans for the stadium's construction on December 6, 1999, and work on the stadium began on March 24, 2000. The first official event was a New England Revolution soccer game on May 11, 2002. The Rolling Stones played at Gillette Stadium on September 5, 2002 on the band's Licks Tour. Jeremiah Freed was the first band to play at the WBCN river rave on June 9, 2002 making them the first band to ever play Gillette Stadium. Grand opening ceremonies were held four days later on September 9 when the Patriots unveiled their Super Bowl XXXVI championship banner before a Monday Night Football game against the Pittsburgh Steelers. Gillette Stadium is accessible by rail via the Providence/Stoughton and Franklin lines at the Foxboro MBTA station, but only during Patriots games and some concerts. The Patriots have sold out every home game since moving to the stadium—preseason, regular season, and playoffs. This streak dates back to the 1994 season, while the team was still at Foxboro Stadium. By September 2016 this streak was 231 straight games. From the 1971 to 2001 NFL seasons, the Patriots played all of their home games at Foxboro Stadium. The stadium was privately funded on an extremely small budget and featured few amenities. Its aluminum benches would freeze over during cold-weather games and it had an unorganized dirt parking lot. Foxboro Stadium did not bring in the profits needed to keep an NFL team in New England; at just over 60,000 seats, it was one of the NFL's smallest stadiums. In 1984, team executive Chuck Sullivan funded the Victory Tour of The Jacksons, in an attempt to earn more profit for the team. Tickets sales failed, however, and the team's debt increased even further – to a final total of US$126 million. After two unsuccessful owners bought the team and stadium, it was clear that a new stadium had to be built for the team to stay in New England. 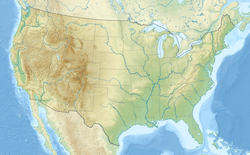 This is when other cities in the New England area, including Boston (which was previously home to the Patriots), Hartford, and Providence became interested in building new stadiums to lure the Patriots away from Foxborough. The first major stadium proposal from another city came in September 1993. Lowell Weicker, the Governor of Connecticut, proposed to the Connecticut General Assembly that a new stadium should be built in Hartford to attract the Patriots to move there, stating that a stadium had "potentially great benefit" if it were built. The bill passed in the State Assembly on September 27, 1993. In Massachusetts, there was a proposal to build a "Megaplex" in Boston, which would be the site of the stadium, as well as a new Fenway Park (the home park of the Boston Red Sox) and a convention center. The proposed sites for this hybrid convention center-stadium were along Summer Street in South Boston or at the so-called Crosstown site along Melnea Cass Boulevard in Roxbury, adjacent to Boston's South End. The administration of Massachusetts Governor William Weld pushed for construction of a full "Megaplex" at the crosstown site, with then-new Boston Mayor Thomas Menino favoring construction of a new, stand-alone convention center in South Boston. Ultimately, the residents of neither of these neighborhoods wanted a stadium, and as a result, Menino backed out, fearing that it would affect his chance at re-election. The Fenway Park plan was cancelled after many "Save Fenway Park!" groups popped up to save the historic ballpark. Kraft then began a plan to build a new stadium in South Boston. In that plan, Kraft was to pay for the stadium himself, hoping to win the support of Weld and Menino. He began to sketch designs, but the project was leaked to the press in December 1996. The residents of South Boston objected to a stadium being built in that location, causing Menino and Weld to become angry at Kraft. Kraft abandoned all plans for a Boston Stadium after the affair. In January 1997, Kraft began talks with Providence mayor Vincent Cianci to relocate the team to Providence and build a new stadium there. The proposed 68,000-seat domed stadium would have cost $250 million, and would have been paid through income taxes, public bonds, surcharges on tickets, and private funds. Residents of the neighborhood of the proposed project were extremely opposed to the project because the surrounding area would have needed massive infrastructure improvements. The proposal fell through after a few weeks. During a news conference in September 1998, the team revealed plans to build a new stadium in Foxborough, keeping the team in Massachusetts. It was to be funded by the state as well as Kraft himself. This plan brought more competition from Connecticut, as a $1 billion plan to renovate an area of Hartford, including building a stadium. Kraft then signed an agreement to move the team to Hartford on November 18, 1998. The proposed stadium included 68,000 seats, 60 luxury boxes, and had a projected cost of $375 million. As before in Boston and Providence, construction of the stadium was challenged by the residents. Problems with the site were discovered, and an agreement could not be reached regarding the details of the stadium. The entire plan eventually fell through, enraging then Connecticut governor John G. Rowland, who lobbied hard for the stadium and spent weeks deliberating with Robert Kraft. Rowland announced at a press conference that he was officially "a New York Jets fan, now and probably forever". In 1999, the team officially announced that it would remain in Foxborough, which led to Gillette Stadium's construction. After the Hartford proposal fell through, Robert Kraft paid for 100% of the construction costs, a rare instance of an NFL owner privately financing the construction of a stadium. On April 18, 2000, the team revealed plans for the new stadium in Foxborough. It was announced as a 68,000-seat stadium at a cost of $325 million, with the entire cost privately funded. Boston is thus the only city in professional sports in which all facilities are privately owned and operated. The Patriots own Gillette Stadium, the Red Sox own Fenway Park, and TD Garden is owned by Delaware North (the owner of the Bruins) (the Celtics rent the TD Garden from Delaware North). Concurrently announced was a new road to access the stadium from U.S. Route 1, and an additional 3,000 parking spaces to accommodate the increased number of fans. The stadium was designed by HOK Sport (now Populous). Kraft wanted it modeled on M&T Bank Stadium which had opened in Baltimore in 1998. Kraft insisted on it having a "front door" with a Disneyland-like entrance. Populous went through 200 designs before coming up with one that Kraft liked. The entrance includes a lighthouse (which was originally designed to shoot a light 2 miles (3.2 km) high) and a bridge modeled on Boston's Longfellow Bridge. The lighthouse and bridge are now featured on the stadium's logo. For the first eight years of its existence the stadium used a video display, with a smaller LED scoreboard just beneath it, at each end of the field. The south side also had a large LED scoreboard in addition to the smaller one. In 2010, the stadium installed two new high definition Daktronics video displays to replace the entire previous setup at both ends. At the time of their construction, the larger screen, at 41.5 feet tall and 164 feet wide (12.6 m x 50.0 m), was the second-largest video monitor in any NFL stadium; only AT&T Stadium had a larger one. Gillette Stadium ranks first among all NFL venues in stadium food safety with a 0% critical violations. The Gillette Stadium food service, instead of being outsourced like most NFL teams, is run in-house and is led by the Patriots executive director of foods and beverage David Wheeler. The venue has hosted the NFL's nationally–televised primetime season–opening games in 2004, 2005, 2015, and 2017 (when the Patriots unveiled their championship banners from Super Bowl XXXVIII, XXXIX, XLIX and LI). The stadium also played host to the 2003 AFC Championship Game, in which the Patriots defeated the Indianapolis Colts 24–14. Eight days earlier the Patriots hosted the coldest game (4 °F, −12 °F wind chill) in New England Patriots history in the AFC Divisional Playoff game when the Patriots defeated the Tennessee Titans, 17–14. Gillette Stadium also hosted the 2007 AFC Championship Game, with the Patriots defeating the San Diego Chargers, 21–12. In 2008, the Patriots lost to the New York Giants in the Super Bowl. On January 10, 2010, the Baltimore Ravens beat the Patriots 33–14 here giving the Patriots their first home loss in the playoffs in Gillette Stadium. The Patriots suffered their second home playoff loss on January 16, 2011 in a 28–21 New York Jets victory. During the 2012 NFL playoffs, the Patriots defeated the Denver Broncos, 45–10, and again hosted the AFC Championship, where they won against the Baltimore Ravens, 23–20. However, the New York Giants ruined the Patriots' season by beating them in the Super Bowl for the second time. The following year, they again hosted the AFC Championship game, where they lost 28–13 to the Baltimore Ravens. During the 2015 NFL playoffs, the Patriots avenged their previous defeat by the Baltimore Ravens by edging the Ravens 35-31. They then defeated the Indianapolis Colts, 45-7 in the AFC Championship. The stadium hosted its sixth AFC Championship game during the 2016 playoffs, as the Patriots defeated the Pittsburgh Steelers 36–17. In all, the Patriots are 16–3 at Gillette Stadium in the playoffs. The seventh AFC Championship hosted at Gillette Stadium came the next year, when the Patriots knocked off the Jacksonville Jaguars by a score of 24-20. In the 2018 season, Gillette Stadium hosted a Divisional Round game, as the Patriots knocked off the Los Angeles Chargers by a score of 41-28. Their success has involved several alleged cheating scandals, but only one that has been substantiated: a 2007 violation regarding equipment being incorrectly placed within the stadium (which resulted in both fines and a stripped draft pick). As part of the UMass football program's move to Division I FBS, the Minutemen played all of their home games at Gillette Stadium for the 2012 and 2013 seasons. The stadium is 95 miles away from the UMass campus in Amherst—the longest trip of any FBS member. The Minutemen's on-campus stadium, Warren McGuirk Alumni Stadium, was not suitable for FBS football in its previous configuration. Its small size (17,000 seats) would have made it prohibitively difficult to meet FBS average attendance requirements, and its press box and replay facilities were well below Mid-American Conference standards. Additionally, several nonconference teams would not even consider playing games in Amherst. McGuirk Stadium was renovated to FBS standards for the 2014 season, but the Minutemen's current deal with the Kraft Group calls for the Minutemen to play four of their home games in Foxborough from 2014 to 2016 in exchange for keeping part of the revenue from ticket sales. Moving forward, Gillette will continue to host UMass football with those games of anticipated larger attendance. Gillette Stadium also hosted the eighth edition of the NHL Winter Classic, between the Boston Bruins and Montreal Canadiens, on January 1, 2016. Memorable Major League Soccer playoff victories include wins over the Chicago Fire in the 2005 and 2007 Eastern Conference Final, sending the Revs to the MLS Cup. Additionally, the venue hosted MLS Cup 2002, four games of the 2003 FIFA Women's World Cup, and some Copa America Centenario matches in 2016. The crowd of 61,316 drawn to the 2002 MLS Cup Final was the largest stand-alone MLS post-season crowd on record until the 2018 MLS Cup in Atlanta at Mercedes Benz Stadium. Gillette Stadium hosted the NCAA Men's Lacrosse Championships in 2008, 2009, 2012, 2017, and 2018 and was the home of the Boston Cannons for the 2015 season. On February 15, 2019, the Premier Lacrosse League announced that Boston would be the first city on the schedule for the 2019 season. It was also announced that Gillette Stadium would be the venue to host the league on June 1 and 2. On June 2, 2019, Gillette will host a handful of games for the Women's Professional Lacrosse League to start their 2019 season. Justin Bieber Fearless Tour 56,868 / 56,868 $3,726,157 Swift became the first woman to headline the stadium. Joel Crouse The Red Tour 110,712 / 110,712 $9,464,063 At the first show, Carly Simon was the special guest. Jay-Z — The On the Run Tour 52,802 / 52,802 $5,738,114 Jay-Z became the first rapper to headline the stadium. Haim The 1989 World Tour 116,849 / 116,849 $12,533,166 Walk the Moon was the special guest. July 25, 2015 MKTO was the special guest. September 12, 2015 One Direction Icona Pop The On the Road Again Tour 48,167 / 48,167 $4,493,993 Liam Payne and Niall Horan, respectively, made a cover of "22" by Taylor Swift, because of the 22nd birthday of both. Charli XCX Taylor Swift's Reputation Stadium Tour 174,764 / 174,764 $21,779,846 Hayley Kiyoko was the special guest on night one. The AMA Supercross Championship has been racing at Gillette Stadium since 2016. Monster Jam has been coming to the stadium since 2014. On November 14, 2006, two days after a rainstorm contributed to the deterioration of the grass surface in a Patriots game against the Jets, team management decided to replace the natural grass surface with a synthetic surface, FieldTurf. The Patriots' first game on the surface was a victory over the previously 9–1 Chicago Bears on November 26. At the conclusion of the 2007 season, Patriots quarterback Tom Brady had a career record of 31–3 on artificial turf. The team lost a preseason matchup in August 2007 to the Tennessee Titans on the new FieldTurf but otherwise won its first eleven regular-season and playoff games on the surface covering the period of November 2006 until September 2008, when the Patriots lost to the Miami Dolphins. In February 2010, the surface was pulled and upgraded to FieldTurf "Duraspine Pro", which was expected to meet FIFA standards that the previous turf did not, preventing the team from having to place sod on top of their turf to host international soccer matches. The surface was upgraded again in April 2014 to FieldTurf "Revolution" with "VersaTile" drainage system. The FieldTurf Revolution product is currently used at many venues across North America, including CenturyLink Field (home to the NFL's Seattle Seahawks and MLS's Seattle Sounders) and Providence Park, home of the MLS's Portland Timbers, where its installation was recently completed. When the field is configured for American football, the Patriots have their "Flying Elvis" logo painted on the field at dead center of the 50-yard line. Off to both sides along the 50-yard line, the Gillette Stadium logo is also painted on the field. This is a gray-and-yellow stylized representation of the bridge and tower at the north entrance of the stadium. 2009 Energy Project Award Winning 525 kilowatt BIPV CoolPly system on the Patriot Place Complex Adjacent to the Gillette Stadium in Foxborough. The Solar Project was built, and is owned and operated by Constellation Energy. In 2006, the Patriots and Kraft announced plans to build a "super regional lifestyle and entertainment center" in the area around Gillette Stadium named Patriot Place. The cost of the project was $350 million, more than the cost to build Gillette Stadium itself; Kraft had purchased much of the surrounding land, about 700 acres (280 ha), when he bought Foxboro Stadium in the late 1980s. The first phase of the project opened in fall of 2007, and featured the first Bass Pro Shops in New England, as well as Circuit City (now closed), Bed Bath & Beyond, Five Guys Burgers, Christmas Tree Shops, and Staples. In December 2007, the Patriots and CBS announced plans to build a themed restaurant and nightclub, named "CBS Scene", at the site, which would also include studios for CBS-owned WBZ-TV. The restaurant was part of the second phase of the project, which included an open mall, a health center, a Cinema de Lux movie theater, a four-star Renaissance hotel, and "The Hall at Patriot Place." Attached to Gillette Stadium, the Hall includes a two-level interactive museum honoring the Patriots accomplishments and Super Bowl championships, plus the Patriots Pro Shop. The first restaurants and stores in phase two began opening in July 2008, and were followed by the openings of the Hall at Patriot Place and the CBS Scene in time for the beginning of the 2008 New England Patriots season. More locations, including the health center and hotel, opened in 2009, along with additional sites in phase one. Panorama of Gillette Stadium, taken from the south end, in 2007. The video screen has since been replaced with a larger one. ^ "Park like a pro around Gillette Stadium". 9 September 2015. Retrieved 14 June 2016. ^ "Stadium Overview - Gillette Stadium". Retrieved July 31, 2018. ^ "Gillette Stadium Overview". revolutionsoccer.net. March 8, 2012. Retrieved October 20, 2013. ^ "National Football League Rules Digest". NFL. Retrieved 17 January 2017. ^ a b "CMGI Field". SportsBusiness Journal. May 20, 2002. Retrieved September 14, 2011. ^ "Vanderweil Engineers". Archived from the original on 9 March 2016. Retrieved 14 June 2016. ^ "Stadium Information". New England Patriots/Gillette Stadium. Archived from the original on October 28, 2008. Retrieved October 10, 2008. ^ "Gillette Stadium Quick Facts". New England Patriots/Gillette Stadium. Archived from the original on October 28, 2008. Retrieved October 10, 2008. ^ "CMGI Field is now Gillette Stadium". CNN.com. August 5, 2002. Retrieved October 11, 2008. ^ "Gillette naming rights extended". ESPN Boston. September 21, 2010. Retrieved September 22, 2010. ^ "CMGI and New England Patriots Agree to Revise Sponsorship Agreement". Business Wire. August 5, 2002. Retrieved October 11, 2008. ^ Vaillancourt, Meg (December 7, 1999). "Foxborough Ok's Patriots Stadium". The Boston Globe. ^ "Gillette Stadium". New England Revolution. Archived from the original on November 8, 2008. Retrieved October 11, 2008. ^ Pedulla, Tom (September 6, 2002). "New Stadium is Champion Pats' Crowning Jewel". USA Today. Retrieved October 11, 2008. ^ "Patriots Cancel Hartford Move". LA Times. Wire Reports. 1 May 1999. Retrieved 14 June 2016. ^ a b Burris, Joe (April 19, 2000). "Light is shed: Patriots Unveil New Stadium Plan, Providing a Beacon of Hope". The Boston Globe. Retrieved October 19, 2008. ^ "lighthousestars.com". Archived from the original on 10 August 2010. Retrieved 14 June 2016. ^ Sando, Mike (July 26, 2010). "OTL: Safer to digest in NFC West". Retrieved July 26, 2010. ^ Breer, Albert (July 26, 2010). "Patriots Run a Clean Operation". The Boston Globe. Retrieved July 26, 2010. ^ "New England Patriots History". Patriots.com. Archived from the original on May 19, 2011. Retrieved August 4, 2009. ^ Vautour, Matt (2011-04-21). 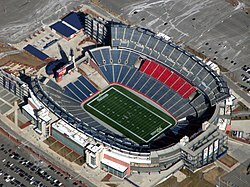 "Gillette Stadium new home for UMass football beginning in 2012". Daily Hampshire Gazette. Retrieved 15 September 2012. ^ Chimells, Ron (April 23, 2011). "UMass football could play on campus again, but not before 2014". The Republican. Springfield, Massachusetts. Retrieved October 20, 2011. ^ "Bruins To Host Montreal Canadiens At Gillette Stadium For The 2016 Bridgestone NHL Winter Classic". Boston Bruins. Retrieved January 26, 2015. ^ "2018 MLS Cup in Atlanta shatters previous MLS Cup attendance record". www.mlssoccer.com. Retrieved January 15, 2019. ^ "Taylor Swift Announces Concert Date At Gillette Stadium". CBS Boston. November 13, 2017. Retrieved November 30, 2017. ^ "Kenny Chesney reflects on strength of his Boston ties - The Boston Globe". BostonGlobe.com. Retrieved 2018-07-12. ^ Colemon, Miriam (2013-07-26). "Carly Simon Joins Taylor Swift for 'You're So Vain'". Rolling Stone. ^ Read, James (July 2, 2014). "Beyoncé and Jay Z band together for Foxborough show". Boston Globe. Retrieved July 5, 2014. ^ Raczka, Rachel (July 24, 2015). "Taylor Swift brought Walk The Moon onstage at Gillette". Boston Globe. Retrieved July 24, 2015. ^ Iasimone, Ashley (July 26, 2015). "Taylor Swift & MKTO Perform 'Classic' at Gillette Stadium: Watch". Billboard. Retrieved July 26, 2015. ^ Frankenberg, Eric (August 30, 2018). "Kenny Chesney's Trip Around the Sun Tour Finishes as His Biggest Tour Ever". Billboard. Retrieved September 17, 2018. ^ Breer, Albert (February 22, 2010). "Patriots Putting in New Field at Gillette". The Boston Globe. Retrieved June 14, 2010. ^ "Gillette Stadium upgrading field surface". 24 March 2014. Retrieved 14 June 2016. ^ Bailey, Steve (January 25, 2006). "New Role for Krafts: Developers". The Boston Globe. Retrieved July 8, 2009. ^ "Gillette Stadium: New for 2006". Patriots.com. April 2, 2006. Archived from the original on August 6, 2007. Retrieved July 8, 2009. ^ a b Abelson, Jenn (May 20, 2007). "Krafts Building a $350m Patriot Place Complex, And A Legacy". The Boston Globe. Retrieved July 8, 2009. ^ "Bass Pro Shop Opens In Patriot Place". WBZ-TV. November 15, 2007. Archived from the original on January 3, 2008. Retrieved July 8, 2009. ^ "CBS Sports Bar & Restaurant Coming To Foxboro". WBZ-TV. December 9, 2007. Archived from the original on October 19, 2008. Retrieved July 8, 2009. ^ Reed, Keith (May 20, 2007). "Patriots Museum Will Have Pizzazz". The Boston Globe. Retrieved July 8, 2009. Roberts, Randy (2005). The Rock, the Curse, and the Hub. Cambridge, Massachusetts: Harvard University Press. ISBN 978-0-674-01504-3. Foulds, Alan E. (2005). Boston's Ballparks & Arenas. University Press of New England. ISBN 978-1-58465-409-4. Wikimedia Commons has media related to Gillette Stadium.